Bloggin' 'bout Books: Unique Format, Fun Plot, Likable Characters? Tweet! Unique Format, Fun Plot, Likable Characters? Tweet! 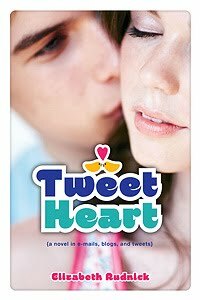 Considering how many hours most of us waste spend using sites like Twitter and Facebook, it's really not surprising that a YA author decided to craft her first novel using only tweets, blog posts and e-mails. What is surprising is how much I enjoyed Tweet Heart by Elizabeth Rudnick. Despite the fact that I'm not exactly hip to the Twitterverse, I found this story utterly charming. Its snappy format, lighthearted tone and likable characters make it a perfect summer read. Sixteen-year-old Claire Collins (@ClaireRBear) is a lot better with boys online than face-to-face, a fact which becomes painfully obvious when her long-time crush starts following her on Twitter. Jack Dyson (@TopofGame17) barely looks at her in the school hallways, but his tweets reveal him to be friendly, funny, and surprisingly sensitive. As the Spring Fling approaches, Claire's trying desperately to figure out how to get Watkins Prep's most popular jock to acknowledge her IRL. They're obviously perfect for each other, so why is Jack so reluctant to talk to her with his mouth instead of his fingers? As she seeks advice from her besties, Charlotte (@LotsOlove) and Bennett (@KingofSlack), Claire starts chatting with Will (@WiseOneWP), another boy who's turning out to have a lot more substance than she ever realized. When Claire finally manages to snag a real conversation with Jack, she's shocked by how different he is in person than on Twitter. Is it just nerves or is Claire's dream guy playing some kind of cruel trick on her? Something's definitely fishy with the whole situation. When the truth eventually comes out, Claire's devastated, but not for the reasons she would have imagined. Is it possible that Mr. Right is actually Mr. Very, Very Wrong? Or that Mr. Never-Thought-It-Would-Happen-In-A-Million-Years could turn into Mr. Perfect? Or is it just the Twitterverse messing with her head again? With her heart all atwitter, it's time for Claire to figure out what -or who - she really wants. While the only thing truly unique about Tweet Heart is its format, this is one of those I-couldn't-care-less situations. I loved this book. It's not nearly as intense as the cover makes it seem, but it's not complete fluff either. It's just a sweet, down-to-earth story about a hopeless romantic looking for love in all the wrong places. And maybe, just maybe finding her happily-ever-after. To the FTC, with love: I received a finished copy of Tweet Heart from the generous folks at Disney/Hyperion. Thank you! fun, fun... as a twitter newbie I find it all bizarre, but I love to hear about new YA novels - I'm adding your link to the sidebar at www.whatallthekidsarereading.blogspot.com - always good to have another book blogger's opinion because there is no way I can read EVERYTHING! The format of this book intrigues me. I have a twitter, but I'm not a big user.